The SLR Factor: As sea levels rise, the flood risk equation changes. Failure to factor in sea level rise is risky business. The evidence is irrefutable. The world’s sea level is rising at the fastest rate in human history, threatening human lives and property. KatRisk, a catastrophe modeling company. Along the coasts of the United States, there is about $6.88 trillion in exposure potential, he explains. Given no changes in flood mitigation, sea level rise costs about $20 million more in insurance losses every year — or about $60 million per centimeter sea level rise, he adds. And Lohman predicts that primary insurance premiums would have to rise on average an additional 0.4 percent a year to pay for the expected higher losses. 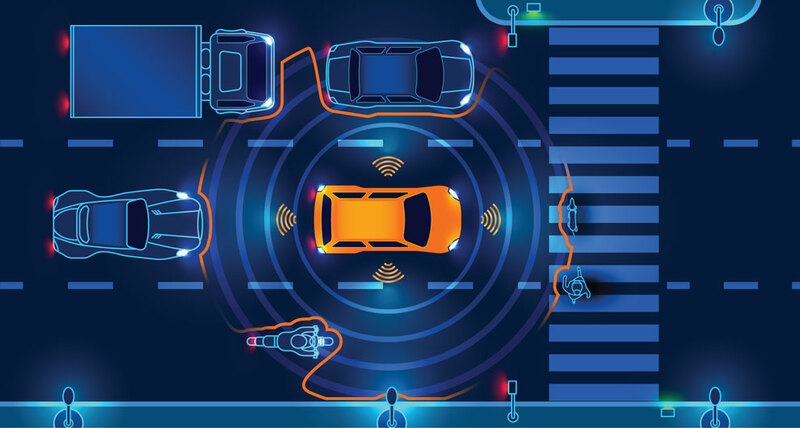 Just as driverless vehicles will be disrupting personal and commercial auto insurance, higher sea level rise will challenge traditional assumptions for underwriting property risk, says Rade Musulin, vice president, casualty, for the American Academy of Actuaries. “This is not your mother’s homeowners ratemaking, because risk is changing and extreme event likelihood is increasing,” he says. In other words, sea level rise and warming water will cause more mega-losses such as hurricanes Katrina and Sandy, Musulin explains. Furthermore, many places are also experiencing land subsidence, he adds, and sinking land makes rising sea levels an even larger threat to property. The question is: Will the coasts of the United States be ready to face that future? Stuart Mathewson, a retired property insurance actuary who contributes to the Actuarial Climate Index (ACI), warns that if appropriate measures are not taken, the effect of sea level rise on insurers — whether private or public — could be analogous to the unanticipated financial burden of asbestos claims. SLR factor will impact flood-specific coverage, including the U.S. National Flood Insurance Program (NFIP), residential and commercial carriers, excess insurers, state-specific flood risk pools and the reinsurers that back them. Actuaries should start considering sea level rise — also known as the SLR factor — which touches multiple lines affected by flood risk. “For actuaries, consideration of sea level rise is an emerging development that will impact pricing and underwriting,” observes Stephen Kolk, president of Kolkulations, an extreme-catastrophe modeler and ACI contributor. “The SLR factor is a risk multiplier that can’t be ignored,” he says. Most directly, the SLR factor will impact flood-specific coverage, including the U.S. National Flood Insurance Program (NFIP), residential and commercial carriers, excess insurers, state-specific flood risk pools and the reinsurers that back them. While the effect may not be as significant for business interruption, workers’ compensation and personal and commercial automobile, actuaries working with these lines should also be aware that the SLR factor is growing in importance. Higher sea levels are due to rising temperatures melting enormous glaciers primarily located in Antarctica and Greenland, explains John Englander, an oceanographer and author of High Tide On Main Street: Rising Sea Level and the Coming Coastal Crisis. Combined, those two landmasses are 50 percent larger than the United States, he says, and their ice sheets would cover the country to a depth almost 10,000 feet high or 2 miles. He uses that to help visualize the amount of ice and the difficulty to estimate exactly how quickly it will melt, which is what mostly raises sea level. Some believe that the melting icebergs and ice cap around the North Pole add to sea level, but they have no effect because they are floating in the ocean. Only the melting of ice on land can add to ocean height. Englander adds that many people are confused about the basics of sea level rise. For example, some believe that the melting icebergs and ice cap around the North Pole add to sea level, but they have no effect because they are floating in the ocean. Only the melting of ice on land can add to ocean height. Even modest increases in sea level can exacerbate the other causes of flooding, observes Englander, who is also president of the International Sea Level Institute. The combination of what he calls “the five flood factors” — storms, rain, runoff, high tides and sea level rise — determines frequency and severity. While each factor has very different causes, characteristics, impact areas and recovery, the fifth factor — sea level rise — is “special,” he explains. Because it is slow and more incremental than the other factors, sea level rise “won’t go down for at least a thousand years, raising the base for all the others,” he explains. In addition to melting of ice on land, sea level is increasing somewhat from thermal expansion directly due to the slight increase in volume as the ocean warms, he notes. From an insurance point of view, where sea level rise will affect policyholders is what matters most. Already, many locations in the United States are experiencing a tipping point, Mathewson says. That is, the sea levels in those places have reached levels where flooding is already occurring without storms. The incidence of flooding along the property-laden East Coast is growing without coastal storms or even a drop of precipitation. Called nuisance or “sunny day” flooding, it occurs when higher sea levels in local areas produce high or “king” tides due to the sun and moon’s predictable simultaneous pull on the earth. The underlying force causing these extreme tides, which continue to break records, is rising sea level, explains Englander. Chart 1: This Actuaries Climate Index (ACI) chart shows that sea level around the 48 contiguous United States rose from 1990 to 2016, according to the Actuaries Climate Index sea level rise module. Chart courtesy of Stu Mathewson. Sea level is expected to continue to rise around New York City. For the 2020s, the low-range projection is 2 inches, and the middle range is to 4 inches to 8 inches, according to “Preliminary Climate Resiliency Design Guidelines for New York City.”3 For the 2050s, the low range estimate is 8 inches and 11 inches to 21 inches is the middle range, the report notes. Released in April 2017, the report also features maps that rank flood vulnerability by street. To see the effect of rising sea levels by various scenarios and location, Englander recommends Climate Central’s website Surging Seas Risk Finder at https://riskfinder.climatecentral.org. (Climate Central is an independent organization made up of leading scientists and journalists who research and report facts about climate change and its public impact.) Consider Norfolk, Virginia, which flooded in late 2016. The site predicts that a 4-foot flood is 60 percent likely by 2020 and 100 percent likely into the year 2050. Flood days there have more than quadrupled over the past 30 years — from 14 days between 1975 and 1984 to 70 days between 2005 and 2014. The site estimates that a 5-foot flood would cover 3.1 square miles in Norfolk, having a property value of $1.7 billion. These values exclude areas that could be protected by levees or other features. The land near New Orleans is also experiencing sea level rise and subsidence; some areas will be too costly to rebuild after the next major storm surge. Lohmann sees this as an example of what is coming for other vulnerable coastal areas in the United States. Rising sea level, Englander says, can affect areas 5 miles to 10 miles inland from the coast, which are often lowlands. In many cases, these areas are lower than the dune line or “beach berm” just behind the shoreline. From Texas, around Florida and up to the Carolinas, there are vast marshes and swamps that will become shallow marine environments, he observes, which are pushing the boundary between land and sea farther inland. Tidal rivers will be affected as sea level rise affects cities within 200-500 miles from the ocean such as Sacramento, Washington, D.C. and Hartford. Flood models that reflect the SLR factor are still being developed, but recent events may hamper their progress. “The busy 2017 hurricane season [has] made the issue of hurricane models more urgent and has slowed development of flood models, and also made paying attention to sea level rise quite rare,” Kolk explains. While commercial insurers for large companies have thought about sea level rise, Mathewson observes, small- to medium-sized firms have not given it the same consideration. Including sea level rise in catastrophe models is becoming an industry best practice, Lohmann says. KatRisk LLC’s SpatialKat catastrophe model, which includes the SLR factor, also features multi-peril correlations between inland flood, hurricane wind and storm surge. Catastrophe models, Lohmann says, “exist because weather and climate models are too coarse in spatial resolution and do not have enough scenarios of realistic extremes.” What actuaries really want, he says, is to have the “knobs in cat models” to adjust climate change scenarios at the property level to fine-tune rates. His company is working on it, but it will take years to fully develop and then to be used across the industry. Hurricane models do include the effect of sea level rise on storm surge, but they are calibrated to what the sea level was at the time of the storm, Mathewson says. “In the storm surge portion of a hurricane model, there’s nothing for future rises in sea level; results are calibrated to actual historical storms, and there is nothing to bring them up to current sea levels,” he explains. This shift is complicated because the rate of sea level change is expected to accelerate. Further, a look at sea levels for the past 20,000 years reveals that sea level change does not follow a smooth or even curved line, Englander explains. Rather, there have been several sudden changes or inflection points in the slope of the line. Chart 2: The Gumbel distribution fits the Actuaries Climate Index (ACI’s) sea level rise standard anomaly data for the Central East Atlantic region. The growing frequency of extreme weather events makes it more important to look beyond simple averages to also pay attention to tails of distributions. Extreme value theory should be applied to quantify risks of the SLR factor, flood and other extreme weather events, Kolk says. The SLR is hitting the eastern side of North America hardest, Kolk says. 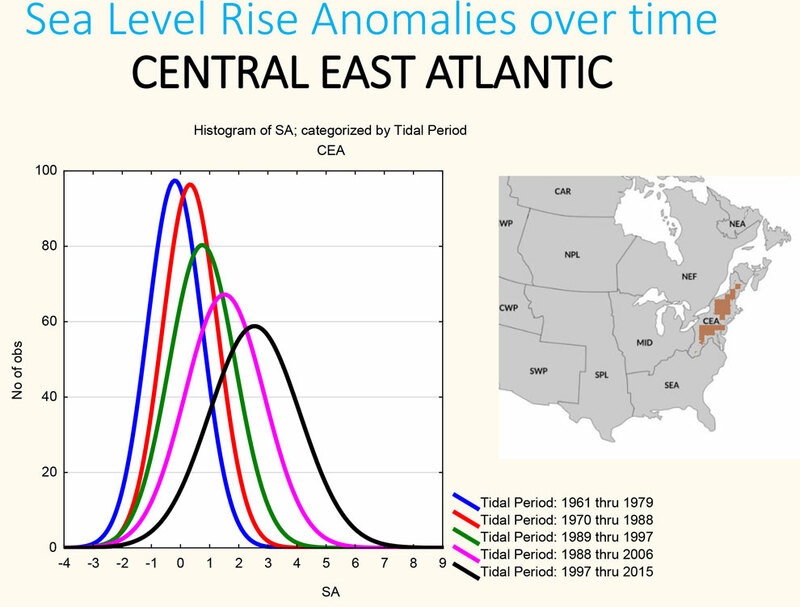 As shown in Chart 2, the Gumbel distribution fits the ACI’s sea level rise standard anomaly data for the Central East Atlantic region, which includes New York City. Other East Coast climate regions show a similar accelerating skewness. The insurance industry is making efforts to encourage flood mitigation and educate property owners through organizations such as the Insurance Institute for Business and Home Safety. Insurance plays a critical role in informing policyholders of the true cost of risk, observes Robert Hartwig, professor and co-director of the University of South Carolina’s Center for Risk and Uncertainty Management. In the case of flood insurance through the NFIP, that message is currently diluted or obscured by federal policies. “People are actually encouraged to build (and re-build) in areas more vulnerable to flooding,” he points out, citing NFIP’s subsidies, the Federal Emergency Management Agency providing disaster aid and a federal tax code allowing uninsured flood damage as a write-off. Insurer rate levels must reflect risk during the policy period, meaning they will not reflect the long-term risk that will be necessary to prepare for future losses, Musulin says. “Experience in other lines, like hurricane and wind, indicates that regulators and the private market have had great difficulty reaching a consensus on rates in lines subject to catastrophic losses, where risk perception changes,” he adds, citing hurricanes in Florida and earthquakes in California as examples. Rising sea levels, especially around the U.S. East and Gulf Coasts, will affect multiple lines of property-casualty insurance in the near and distant future. As actuaries consider the ramifications, they will also need to acquire new skill sets to account for the rising tides. Thankfully, catastrophe models will continue to grow in sophistication, allowing actuaries to assess the true risk of flooding. As the actual risk increases, there will likely be affordability challenges for property owners and their insurers. 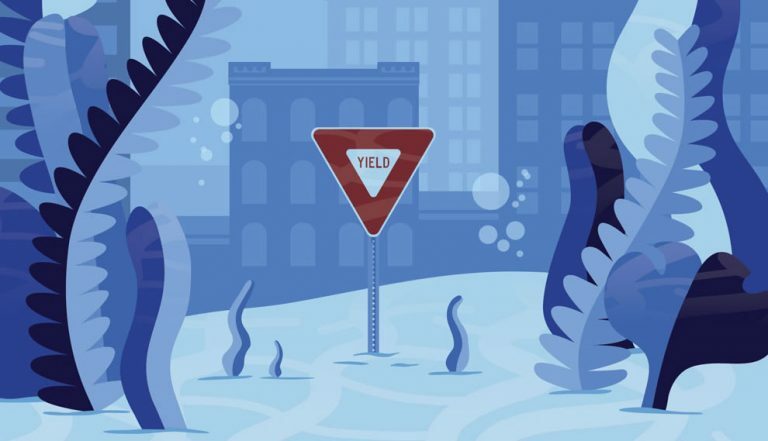 In places like New Orleans, people have already lost their property due to rising sea levels, which hints at what is to come in future decades. It is difficult to convince politicians and voters to invest money into problems that are decades away, especially when rising sea levels are too often mired in the politics of global warming. While the burden to protect the coast lines will fall on the government at local, state and federal levels, the larger question is whether the nation will be ready when sea levels become an issue too important to ignore. It is difficult to convince politicians and voters to invest money into problems that are decades away, especially when rising sea levels are too often mired in the politics of global warming. Since actuaries quantify the actual cost of risk, they can play a critical role in demonstrating how the SLR factor will impact the future while preparing insurers for the expected onslaught of losses. In return, lawmakers and regulators will need the courage to support that reality for the sake of future generations. Annmarie Geddes Baribeau has been covering insurance and actuarial topics for more than 25 years. Find her blog at www.insurancecommunicators.com.